This repair manual covers all Asian: Autos, Trucks, Vans & SUVs between 2000 & 2003. Great for dealerships, fleet repair shops, professional mechanics, libraries, schools & car enthusiasts. Designed for the experienced mechanic who is equipped to work on cars. 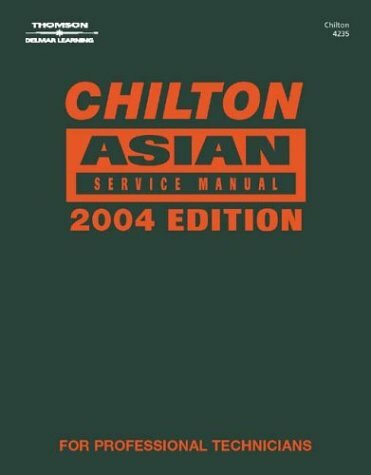 Chilton Service Manuals are comprehensive and technically detailed, offering TOTAL maintenance, service and repair information for the automotive professional. Comprehensive, technically detailed content is supported by exploded-view illustrations, diagrams, and specification charts, all carefully organized by system and model for easy reference. Step-by-step procedures, from drive train to chassis and related components, help yield fast, accurate repairs.